Uglyworld #206 - Wage at Aachen Xmas Market, originally uploaded by www.bazpics.com. 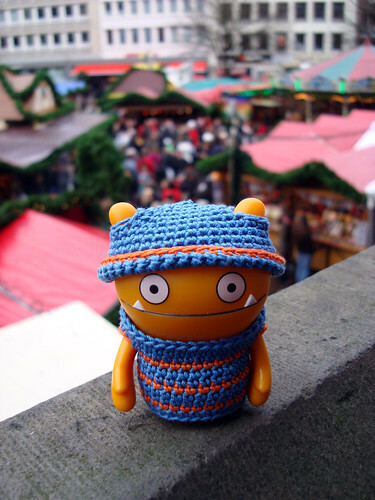 Having seen the photographs of Ice-Bat at the Weihnachtsmarkt in Freiburg during the week, Wage Jr was on my case almost non-stop to visit the Christmas market which is held at the main market square in our hometown of Aachen in Germany. As the temperature is only JUST above freezing at the moment Mireille first made sure that Wage was dressed with his jumper and hat to keep him warm in the city, and then When we reached the market Wage made a bee-line for the food stalls first and ordered a couple of "reibekuchen" (what I would call a potato fritter if I was back home in Scotland) to eat. Once the reibekuchen were finished we tried to find the best location for him to have a picture taken, Wage wasn't too happy with the first few shots taken at ground level around many of the market stalls, so he set about finding a better location. After 5-10mins of walking, stopping, walking, stopping, looking around and some more walking and stopping he finally realised that the stairs to the Rathaus (town hall) weren't looking too busy. He stood on the wall of the stairs and posed with the colours of the market stalls behind him, so many people wanted to ask him where he was from and a few were more interested in his clothes - which when questioned he replied with "It's best to ask my Mama, she's over there - I'm very busy posing just now for my nice xmas picture".